Clearly a majority of event owners, event planners & event organizers have embraced social media to market their events. But using a HASHTAG to attract and promote is scratching the surface. Very few events have realized the Power of the Hashtag DURING events. Twitter, Instagram, Youtube and now SnapChat have gained popularity in Corporate conferences, Tradeshows, Weddings, Incentives and just about any large/small congregation. But is your hashtag being utilized by ALL attendees? We track tons of event hashtags, but less than 2% attendees use it at the event and most posts/tweets are by your social media agency. Yes it is that low! Why? Our experience clearly indicates LACK of gratification. Adding live projections boosts contribution by as much as 300%. 2 essentials of any social media campaigns are hashtags & content. Digital walls collect this social media footprint in real time, including posts, images and videos into one interactive visual. These dynamic visuals are displayed at-venue that encourage people to share for a chance to show up on display. Don’t forget you can gamify it . Read more below. An additional boost can be provided by integrating your mobile app to social. Using solutions like ours, users tweet with your hashtag directly from the app in addition to the private activity wall of your brand in the app. Our data has shown 10x more engagement with private activity walls compared to social media. 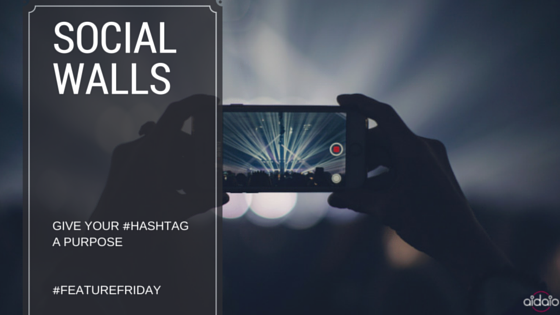 Using Social Walls your hashtags will no longer get lost inside a social bubble. And did we say you get to moderate ? How our clients used Digital Walls ? A Popular Singer took stage only after a certain number of tweets were posted by the audience LIVE. The Digital wall was used as a countdown while audience saw their own tweets projected. The Bangalore International airport used Digital Walls to get audience to engage which lead to the hashtag trending. Reach out to us for more use-cases and a trial. The AidaIo platform is focussed on driving engagement and getting you up close and personal with your audience. We have built a suite of features to create interaction and engagement. Contact us to know more. Engaging events are never a one-way journey. It’s all about interactivity and capturing the imagination of your audience polls. Instant audience engagement and interaction can be rewarding, not only in terms of evaluating your event but also to prepare for the next. Then comes the fancy world of ARS (Audience Response System). Yes, the same thing that you see in some of the TV shows. The presenter asks a question and the audience press a button on a small voting pad and shares their votes. There is a receiver device that captures and consolidates these votes. On the first look, ARS does seem very interesting, but as you delve deep into its world, you realise it’s just more responsibilities falling on your shoulders, in terms of procuring the devices, testing them and the list goes on. Procurement – First and foremost, for using ARS in your event, you must plan ahead to procure or rent the devices. Once procured, they have to be stored appropriately. Capacity – The number of devices needed for your event depends on the number of targeted voters. Each receiver has a set capacity, which is usually around 200-500 voters. Cost – The rental cost is often around $5-$20 for each voting device. Over that, there is a fixed cost that is to be paid for the receivers, which could be anywhere from $800 to $1000. Powering – Once procured, you have to ensure that all the devices are powered and working properly. These devices work on small batteries, which need to be checked often and recharged. In case of faulty devices, you need to get them repaired ahead of the onset of the event. Dry runs – And once that is ensured, you must go ahead and carry out multiple dry runs with the devices and receivers. A small amount of training and ‘getting-used-to’ is required for setting up polls. Handling – You also need volunteers to hand out devices and collect them once the voting is over. With larger events, ARS becomes all the more cumbersome to distribute, collect and store. Proximity – If the targeted audience is distributed across the venue, then good luck on getting them to assemble at one point and casting their votes. The voting pads need to be within the range of the receiver, which is usually a radius of 100 meters. There’s got to be a better way. Each one of us carries a smartphone today, so how about putting them to good use at events. How about sending Polls to your audience through your event app? Using the right tool makes it a lot easier. The audience have their smartphones in their pockets, so you don’t have to worry about any of the above problems. Even if the audience is spread across the venue, you can broadcast a poll and they can send their responses from wherever they are. Moreover, at a given point of time, multiple polls can be active simultaneously. Users can peruse previous polls and their votes. As the results pour in, you can display them on a live display screen of your choice. Just imagine the plethora of analytics possibilities that would be available. Based on how an individual vote’s, you can target content to her appropriately. You could make use of these learnings to plan your next event. Since the possibilities are endless – Make sure you make the most it! 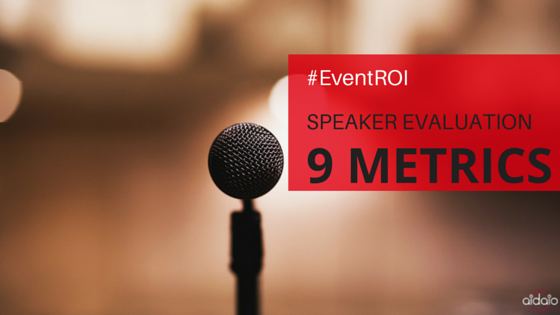 This is Part 2 of our Event ROI series – Venue Performance Evaluation. Check out Part 1 -Speaker Evaluation. When organizing any event, an event planner has to make many decisions that will have an impact on the overall success of the event. Deciding upon the best event space is one such delicate decision that has the largest impact both on experience and budget. There are lots of reading material on how to choose a location. Here is the link. But often neglected is getting feedback from the attendees post-event about the Event space. 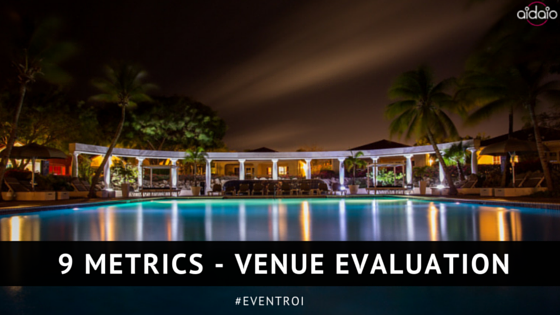 Evaluate your venue performance with these 9 metrics (w/BONUS). How good were the basic amenities at the venue? Like lighting, water, power, fire exits, etc. Was it too crowded ? Was there ample space for networking or finding people? How were the acoustics at venue ? Too loud ? Was it hard to hear people? Was it easy to locate the place? Parking? Public transportation availability? Were the venue staff/in-charge easily accessible ? Did you know/utilize the venue concierge service? Was the layout easy to navigate? Did the floor plan help to locate areas of interests? What was your impression of the overall decor and ambiance of the venue ? Would you recommend or visit the event space again with family or colleagues ? Using Aidaio Event apps you can not only capture above data efficiently, but also provide venue information such as parking information, interactive floor plans and much more. It has always been a challenge for meeting and event owners to create Event ROI that is meaningful. With the onset of Big Data this challenge needs to be addressed with Actionable ROI and not restricted to Vanity metrics. At AIDAIO, we believe a significant part of the answer lies in data generated by event technology and mobile apps. Using the Customer Experience Pyramid we are excited to start a series to provide Actionable metrics for event planners to measure various aspects of Event ROI. We are glad to hear from you and add to it. Do reach out at [email protected] or tweet us @teamaidaio. Did the session cover the topic announced ? Did you get enough time to ask questions ? What is the best idea you heard in the session ? Did the Speaker communicate effectively ? Was she or he too fast ? too slow ? Did the Speaker share their social credentials & presentation(s) for post-event reach? Did you gratify attendees to participate in LIVE polls & quiz ? Would you recommend the session/speaker to someone else? The Apple WWDC 2016 concluded yesterday. A ton of exciting announcements – link . Lots of analysis already out there about it and we will soon have ours. In the meanwhile here are 7 mind-blowing facts about Apple that Tim Cook talked about. 9 Year old Anvitha Vijay is the Youngest developer at WWDC 2016. In 8 years number of apps in Apple app Store rose from 500 to 2 Million. 130 Billion App downloads till date. Siri Caters to 2 Billion requests per week. 15 billion apple music subscribers. When someone is upset or needs help do you send them a Facebook ad or a promotional message? Every person is different and a simple personal touch goes a long way to ensure a happy user. 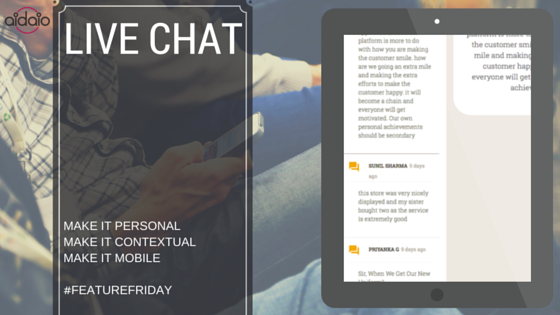 Live Chat feature is a powerful tool integrated into your mobile app for feedback & support. Think of it as a “Whatsapp” In-app messenger dedicated for your business. In the mobile era, users like to engage in context, when they face a problem. If they have a question or suggestion they will not email you, let alone pick up a phone. They sulk, get annoyed and stop engaging with your brand or worse Tweet. Having an In app Live chat removes the friction for someone to initiate a conversation. It makes it easy for your consumers to interact with you and be personal. Use Live Chat to enable feedback, support and marketing. Adding Live Chat to your app lets a user start a conversation with you. A new conversation is started an you(admin) will get a mobile notification. Tapping on that notification will take you to the chat screen where you can see the user’s message and respond immediately. With Live Chat on you can also initiate a conversation with any user. Simple isn’t it. How our clients use LIVE Chat ? At Events, attendees have used it to get travel details, communicate last minute change of plans and reach out to organisers when they run hindrance. Restaurants use it to take reservations from their customers. Hospitals use it to get in touch with their doctors. Brands have used it to send personalized offers for loyal customers. HR and Employee engagement use it to solicit suggestions. Accordingly, Make it personal, mobile. and contextual. Make them SMILE. Build your community.  With Aidaio’s platform, you can focus on driving engagement and getting up close and personal with your audience. We have built a suite of features to create interaction and engagement. Contact us to know more. App…Why its better to be Native and not Hybrid. Why your app would be better by being Native and not Hybrid. Once you lose your phone, all other priorities go out the window. In today’s world that’s how much we value our mobile device. It’s with you every minute of the 24 hours. That leads us to the question we need to ask ourselves as App promoters & App makers. If the value of a mobile device is so immense, shouldn’t Apps we deploy be more reliable, respond faster, and give all the answers your customers need as soon as possible? Let’s skip the topic on why users download an App. 85% of consumers prefer mobile Applications over the mobile website – Source. Consumers want to chat real-time, view directions, set reminders, take pictures and much more. They use gestures, swipes, and are willing to uncover hidden actions that adhere to the guidelines of the respective platform. Your App needs to feel consistent with core native Apps on their devices. Consumers expect proactive and relevant information within the context of their location at a particular time. Apps are expected to push personalized content based on their actions, with the ability to share content socially. 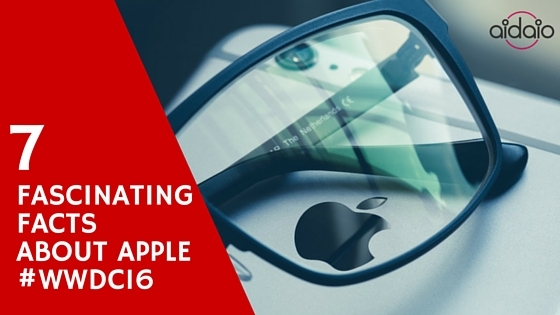 App makers need to integrate emerging technologies like ibeacon, virtual reality. Apps are expected to work offline and degrade gracefully – not show a loading spinner. Let’s correct ourselves – these aren’t expectations anymore. This criteria will make or break the success of your App. The customer experience of your App is more important to your brand than you might think. Apps that look great but perform poorly, will damage your brand. 79% of consumers would retry an App only once. Only 16% give it more than two attempts – Source. You may get a chance to get it right once. but most certainly won’t get a second one. The core of ensuring a great experience is using native Apps. Not hybrid ones that are HTML5 websites packaged into native wrappers. Can’t tell the difference? A simple eye test is to launch your Application in airplane mode and experience it., You are going to know the difference! A few years back, it was expensive and time-consuming to build native mobile applications. In today’s ASAP world it’s easy to give up on getting a good App partner or choose a hybrid App approach. But with a platform like ours, cutting edge technology exist that provide custom branded Apps with authentic native experience at prices that translate to huge ROI. A long lasting relationship depends on the quality of each encounter – not just the first one. So do NOT compromise. You’re exploring event apps for your next event, but you’re unsure whether attendees will download your app? Do you feel that event marketing for your app can take up much of your time and effort? According to EventManagerBlog, 29% of event professionals reported less than 35% of their attendees downloaded their event app. This is a real problem! Our experience shows that event engagement increases when at least 50% of your attendees download the app. Event apps can boost attendee engagement by over 77%. Event apps also offer many tangible benefits for event organizers. Leveraging event apps can help you realize significant ROI from your events. We have seen that with some simple app promotion strategies, you can ensure upto 65% downloads pre-event. Yet most organisers feel that app marketing is an additional task at hand. Given your hectic schedules especially closer to the date of the event, you may feel overwhelmed with the task of promoting apps. Yet, to ensure that attendees download event apps, an app promotion strategy is a must. The good news is that event app promotion is not such a hard task. There is but a little effort involved in ensuring app downloads. Plugging in app promotion as part of event marketing strategy can help you create a much better impact. App promotion methods are subjective to the type of your event. Listed below are some of the simple event marketing steps for your app that we recommend . Consider these for promoting app downloads and adoption. App availability before event – Ensure apps are available for download at least 2 weeks before your event. Look for event apps that offer the flexibility to change content without the need to publish the app to the app stores. Also see the event app with rich, relevant event information. Your attendees don’t want to download an app that is blank, and with no relevant content. Email marketing about the app – When you send out EDMs to your attendees, speakers, and sponsors, include a short highlight about the event app. Sending out one or more exclusive emailers detailing why your attendees need to download the event app can also be helpful. Plan for these EDMs in the 2 weeks lead up to your event so it stays fresh in your attendee’s mind. Familiarity – When you are familiar with the features of your event app you can influence your audience effectively. If you don’t use the event app yourself, it can be quite pointless to ask your audience to do so. So make sure you and your on-ground team downloads and actively use the app. Content – Keep your app content up-to-date. Keep your attendees’ interest alive even pre-event. Publish event trivia, photos from event planning, quotes from speakers, and all event related updates. Make sure that your attendees look forward to seeing fresh content every day. Interesting, relevant and timely content is a great way to trigger app promotions. Incentivize attendees – Educating attendees about the value of the event app is one way to trigger app promotions. In addition, you should also consider other incentives. Offer special discounts, goodies, VIP check-in, special seating. Running contests in the app for early adopters can help create a buzz, that could trigger organic downloads. At-venue app signage – Make your event app visible. Provide a chance to download the app during the event. Printed posters of the app at registration desks, QR codes to app URL on delegate kits, app details on event background displays, short announcements etc. can help promote adoption. In-session promotions – Reminding attendees to rate sessions or post questions will encourage app usage and downloads during the event. Create a community – Don’t stop at pushing information. 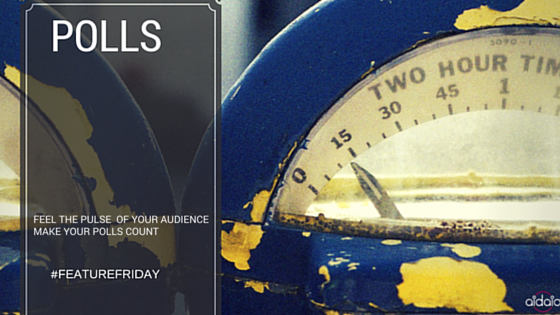 You want your attendees to engage with your content. Once you reach a certain threshold of users on the app, start publishing polls, or posts seeking inputs from your audience. Use data from these polls to attract other attendees to also download and participate in the event community. Do not just focus on creating an event app – focus on creating the experience around your event app. Promoting an event app does not need to be an isolated activity. When you channelise a small percentage of your event marketing efforts to include event app promotion, it can positively impact app adoption. Pallav Barah, Founder & CEO of AIDA, shares his insights on event technology and consumer engagement in an interview with T Radhakrishna of Elets News Network (ENN). The interview is featured in the eGov magazine’s April 2016 edition. How did the concept of Carrot evolve and what went into the making of the product? Carrot is an idea that was born in a conference. We at AIDAIO observed a significant lack of digital connect at some of the conferences we attended. We spent three months speaking to event industry managers, attendees and sponsors to understand the dynamics, pain points and needs of the Indian event industry. We created Carrot keeping in mind the challenges in the event industry, including the lack of / minimal wi-fi connectivity at events, as well as the last-minute updates required to be made. The first Carrot app was sold even before the company was set up, and within six months of launch, Carrot was shortlisted under the Best Event Technology category at MICE – Asia Pacific Awards 2015. When did it go live? What are the unique features of Carrot? Carrot was launched in Novmber 2014 with a vision to bring the focus back on attendee engagement, and nurturing private social communities at events. The core value proposition of Carrot is the ability for event managers to design, theme and publish on their apps within one hour. Carrot is powered by a cloud-based backend that provides great flexibility and agility to event managers to manage last-minute changes, turn on/ off features, and even access content when there is no internet. Due to this flexibility, Carrot app can be used for any kind of event – business or technical conferences, medical conferences, networking events, exhibitions, trade shows and even weddings. The backend also provides powerful real time analytics for event managers to monitor and react to the pulse of the event. Recently, Carrot launched some multilingual apps to empower event managers to publish content in more than 25 languages – Indian and Global. Its various interactive features increase audience engagement through polls, surveys, games, private chat, etc. We also have smart integrations with EventBrite to manage ticketing and registrations and with Uber to create a seamless channel for attendees to not just find the event venue but also book their ride to the venue. What are your expectations from Carrot? We expect Carrot to democratise event technology and enable every event big or small to adapt event technology solutions. Today, the MICE (meetings, incentives, conferences, exhibitions) industry in India is growing fast. More and more events have started to place the right emphasis on audience engagement, and to create an experience that converts passive attendees into brand ambassadors and influencers. This change is not possible without creating an interactive, conversational channel that can help the event brands hear what the consumer has to say, and react to it quickly. AIDA’s vision is to lead this change, and create the right technology that can complete the high touchpoint human interactions, without compromising on ease of use and consumer experience. What is the roadmap for growth of AIDAIO? We at AIDA have launched three products in the event technology and attendee engagement space within a span of 15 months. Carrot – native white-labeled event app; Ice – interactive digital games for product activations; and Hashout – live projected slideshows and social walls, are all geared towards creating a wow experience for attendees at events, and providing flexibility and real-time insights to event organisers. The road ahead for AIDAIO is to continue to provide end-to-end solutions, which can seamlessly cover the end-to-end experience of an attendee right from the time an event concept is created too much after the event. Attendee engagement is a journey. Brands strive to build an emotional connect with a consumer. It begins with powerful messaging. But brands can sustain this only by creating amazing experiences, and building a community. Events are a high touch point channel for brand to connect with a highly activated audience. The journey of a brand’s connect with its attendees begins with Brand visibility, and progresses towards Brand activation, then engagement and finally creating Brand Ambassadors. Technology is a great enabler for consumer engagement whether it is in events or elsewhere. Social media and cross-channel marketing strategies are quite powerful in reaching out to potential consumers. But, often brand connect and social communities stay out of sync. It is important to have solutions that create a unified persona of the consumer across the different channels. Also important, is the need to understand the consumer’s context, and target relevant content based on her location, interests and preferences. At AIDA, we see this connect between brand and consumer evolve through 5 stages. Guidance: When a brand initiates it’s connect with consumers, it is crucial to guide, educate and inform them. This is the first step towards understanding what a brand stands for, and what the consumer can gain from the brand. In the case of events, the program schedule, speaker list, venue etc. serve the purpose of guidance. But, bringing in an interactive aspect to this information can change the way a consumer receives this. Structuring content such that it leads a consumer on a journey of discovery, can help make Guidance a fun way to connect to the consumer. Simple interactions, such as RSVP on agenda, guided maps; chat to speakers etc. can go a long way in establishing the ground for the next stage of Engagement. Engagement: As consumers embark on their journey of content discovery, they find more and more reasons to engage with the brands. Even asking for more information or expressing an opinion about the brand’s content can be gratifying. This engagement sets the grounds for brands to initiate 2 way conversations with their consumers. In events, many of these conversations are primarily face-to-face. Can technology complement these face-to-face conversations? The answer is a resounding Yes. Polls, surveys, event activity walls, 1 on 1 chat with organizers/ event partners etc. are easy to use technology complements. Games such as Treasure Hunts are an effective way to activate your audience. They can have a great time while discovering brand content! Community: When people have a good time, they tell others about it. They create their own communities, and share their experiences. This is a key social behavior that brands can leverage. Social media is a space where most of a brand’s community building happens today. But, social media is an open forum. A consumer needs to sift through a lot of noise before they can find relevant content. There is a need today to create a channel that can seamlessly combine social media advantages with the private social context of a brand. White labeled mobile apps serve as a context aware channel for brands to achieve this. Providing a space for attendees to connect to other delegates, share, like and comment on event activities, creating a social buzz in the context of the event, creating multi lingual content etc. can nudge even the passive attendee into being part of the larger event community. Achievement: Sustaining the community connect, conversations is equally essential. Recognizing the influencers in the community, responding actively to the pulse of the community, identifying trending topics is a good way to begin. But, unless there is a sense of achievement that your consumer can realize from her engagement, this buzz is likely to die down. Gamification is a great way to push the community engagement to the nest stage. Can you reward the active participants or even promote a healthy competition among the peers? Combine social conversations with in-venue gratification by launching in-venue gamified social walls. Plan a crowd sourced social activity that can result in a larger achievement or reward for the entire community. For instance, if 50 photos are posted under the event hashtag in the next 1 hour, everyone gets a free coupon! Brands no more need to worry about creating content, since the community has started co-creating content for them. Influence: When the community is so highly activated, everyone is a brand ambassador. Even the passive consumer, is now an active influencer for the brand. In the case of events, this translates into extending these conversations over and beyond the event. Turning them into a year long conversation channel, and as a lead up to the next edition. So, what are you waiting for? Start your journey with AIDA today. Activate your passive consumer into passionate brand ambassadors. How AIDAIO made Tesco Foundation Day 2018 a digital success! How to plan and deliver your event app content! Why We Love QR Code Check-ins at Events! © 2019 AIDAIO. All Rights Reserved.